Alex Etling and Kiley Caughey in Gruesome Playground Injuries. Photo by Lauren Morrison. BOTTOM LINE: The strong performances make the dramatic turns and dark humor of this work believable and compelling. When a play has been performed multiple times by differing companies making vastly different choices, it becomes clear just how much these choices can affect a play’s overall affect. 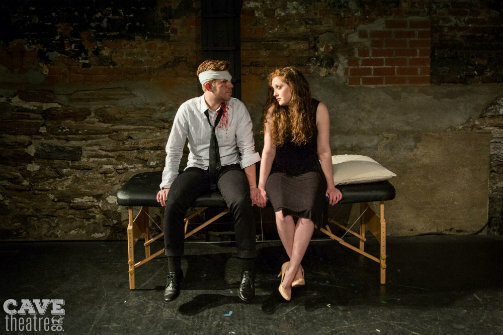 Since Gruesome Playground Injuries’ premiere production in 2011 off Broadway at Second Stage Theater, it has been revived multiple times at smaller venues. The last production that was reviewed by Theasy emphasized the bleakness and despair of the characters. This latest production by Cave Theatre—despite having characters that attract tragedy—emphasizes the warmth and closeness running beneath the tragedy and gore that fills this work. The play begins with Kayleen (Kiley Caughey) and Doug (Alex Etling) meeting as morbid third graders in the nurse’s office where Kayleen asks to touch the gaping wound on Doug’s head, shivering with glee at how gross she finds it. The play then speeds forward in time showing the two at differing points in their thirty year long relationship, with the two suffering from both physical and emotional wounds. Doug seems to have a penchant for being careless and taking risks (the fact that he often ends up injured from these risks may or may not be part of his reason for being fixated with taking risks that jeopardize his life.) Kayleen, meanwhile, suffers from a nervous stomach that leads to vomiting and having stomach aches when life throws her emotional turmoil she cannot quite cope with. During the course of the play Doug struggles with such random accidents as permanently losing an eye due to a fireworks mishap and winding up in a coma due to standing on his roof during a storm and getting struck by lightning. A classroom chalkboard lining the back of the stage denotes what age the characters are and what incident or injury they are uniting over. Though the two slip out of each other’s lives for long periods of time they seem destined to stay together and reunite over hospital beds and sick days. The more the two fall to pieces both physically and emotionally the more they realize their need for one another. Whereas in the play’s original inception scene information was projected onto the stage, now it is written on a chalkboard lining the back of the stage surrounded by children’s drawings, emphasizing the fact that the two have known each other since the age of eight. The two actors pull this play along, even with lines that dart into extreme drama and sometimes sentimentality, making each line feel authentic and making the events of the play compelling ones. They are just as convincing as eight-year-olds as they are as 38-year-olds. Through the strength of their emotional and nuanced performances the actors make us believe two characters wanting to love each other, battle scars and all. Gruesome Playground Injuries is by Rajiv Joseph. Directed by James Masciovecchio. Set Design is by Name. Stage Manager is Luisa Sanchez Colon. The cast is Alex Etling and Kiley Caughey.